Do you like zucchini? If so, know that regular consumption of this tasty vegetable very good for your body ..
Gourd general, commonly known as zucchini, with us normally grown compared to other vegetables relatively short time, but its popularity is still growing. Not surprisingly, zucchini does have a wide range of applications in the kitchen and vegetables are also a very beneficial effect on our health. Courgettes are relatively undemanding vegetables to grow and care for them, we pay much. If we provide them with soil rich in nutrients, plenty of toppings and sunny location, well prosper from one plant sometimes reap many pounds of juicy fruits. It is important to keep the plants enough space to grow creepy, like cucumbers. We can reap the first fruits of the end of June to early July, depending on conditions, the plant produces throughout the summer. Growing courgettes is also financially advantageous, 3-4 plants is sufficient for normal consumption of one family. Young zucchini have a stronger flavor and often a higher content of beneficial substances and can also be eaten with peel. Older large fruits will also find wide use in the kitchen, their skin often hardens and becomes difficult edible, it is then necessary to exfoliate. About 90% of the zucchini fruit is water, in older fetuses is somewhat less, a significant proportion are also very beneficial fiber. Noteworthy, however, is the richness of courgettes on important vitamins and trace elements. Young zucchini fruits are for us the healthier choice, many important substances is found in the skin, which is fine for young fruits and easily digestible and are eaten raw. It is an excellent source of carotenes, synthesized by the body to vitamin A, the protector of the health of mucous membranes, and one of the most important bioactive substances for our body. Vitamin A is essential for metabolism in cells, it is necessary for the absorption and processing of many other important substances in the body, protects our eyes, has a positive impact on our overall physical and mental vitality. Vitamin A is a fat-soluble, it is necessary to consume zucchini added at least a small amount of oil (preferably olive), in order to allow the absorption of vitamin A in the body. The skin of vitamin E can also be found with similarly vital action, in whole fruits and then on a lot of magnesium and calcium, also phosphorus, potassium, iron, copper, zinc and some B vitamins. As can be seen already from the above list of ingredients, zucchini are almost ideal food for those of us who try to keep their line, or lose weight - and healthy. The high water content makes calorie foods zucchini (about 20kcal/100g vegetables), and a high content of biologically important substances are zajisíi intake of essential minerals and vitamins. Courgettes can be included in our diet almost daily since it can be modified in a number of different ways, so our diet becomes boring and difficult dodržitelnou diet. If you want to lose weight, then as carefully considering your health, just in this case are appropriate and zucchini also healthy food. Fruits marrows cleans our body in two ways. Contained potassium acts as a stimulant excretion of excess water in the body and helps with established leaching toxins and acids and stimulates the kidneys. This feature is useful for example for individuals suffering from medical conditions such as gout, diabetes, rheumatism, swelling of the extremities, overweight and so on. Due to its high fiber content have zucchini cleaning effect also on our digestive tract, especially the intestines. Cleans the walls from dangerous deposits and improve overall throughput intestines, one might say, of zucchini has a slightly laxative effect, but without the risk. Vitamin A also helps maintain healthy intestinal mucosa and resistant to infection, inflammation and microorganisms. How to edit the zucchini in the kitchen? On this question, there is an incredibly long list of answers, a plethora of recipes and processing options. Young and petite Raw fruits are great in salads, simply washed and cut into very thin slices, excellent taste in combination with eg tomatoes, peppers, cucumber and herb dressing or yogurt, or with the addition of balsamic vinegar and olive oil. Courgettes are suitable but perhaps any heat treatment, we can fry them in batter, scallop meat, vegetables, or pasta, broil, braise, bake, larger fruits can meet and scallop stuffed with cheese. The zucchini can also prepare various spreads, soups and sauces, they can be treated as cucumbers, or mushrooms and other vegetables .. recipes will certainly find a book. 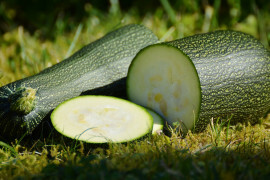 - Wash the zucchini and cut into 1 cm thick slices or wheels, brush both sides with oil (or garlic) and season to taste. Slices first grill for about 5-10 minutes on one side, turn, sprinkle with grated cheese and grill the other about 5-10 min. This adjusted zucchini tastes great either alone or as a supplement to grilled meats, fish, or other vegetables. Do you know the herbs to boost immunity? Which herbs cures coughs, colds and flu? Would you like homemade herb vinegar? Bananas - you need to be healthy and fast? Banish spring fatigue without apothecary! Bukvice Medicine is a natural "cure-all"
Černucha Gourd - you know the medicinal black cumin? Do you know how healthy are the potatoes? Flu? angina? Cholesterol? diabetes? Garlic ..! Into the new year full of healthy resolutions? Weight loss or a New Year ..
Vitamin D or why tanning is healthy? White willow - whip, cats or aspirin?